There are three primary graphics routes in R (base graphics, lattice, and ggplot2), and each have their zealots. 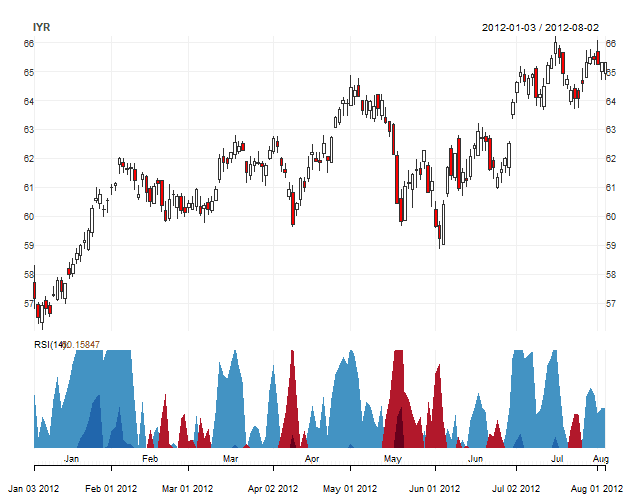 Last time in More on Horizon Charts, I used lattice and latticeExtra. This time we will build horizon plots in base graphics, and I was pleased with the result. Unfortunately, there is one small issue in that the points of change from positive to negative overlap. Please let me know if you have a solution. Thanks to helpful readers for their comments and code changes, this is now fixed. Now, let’s implement a for loop and mirror the negative values. With horizon chart functionality in base graphics, hopefully we can add this type now to other packages. Here is a potential example using quantmod. So your polygons do not match the data. To get the graph working right you will have to determine the crossover point - which is not the value of x of either of the two dates but for some point between those two values. Then use that point to define the polygons. after you make the first plot with the positive and negative polygons.